Massive MIMO takes advantage of the reciprocity of the over-the-air (OTA) channel in TDD to reduce the overhead in channel estimation. It estimates the downlink channel based on the uplink channel obtained from SRS in uplink. For this to work, the Tx and Rx chains in the base station RU must be calibrated so that they are reciprocal. This module is similar in function to our 8×8 MIMO SDR except this module has built-in circuit to perform the reciprocal calibration of the 8Tx and 8Rx chains. More importantly, the built-in calibration circuits can be chained for reciprocal calibration of a larger RU, e.g., a RU with 64Tx and 64Rx chains. 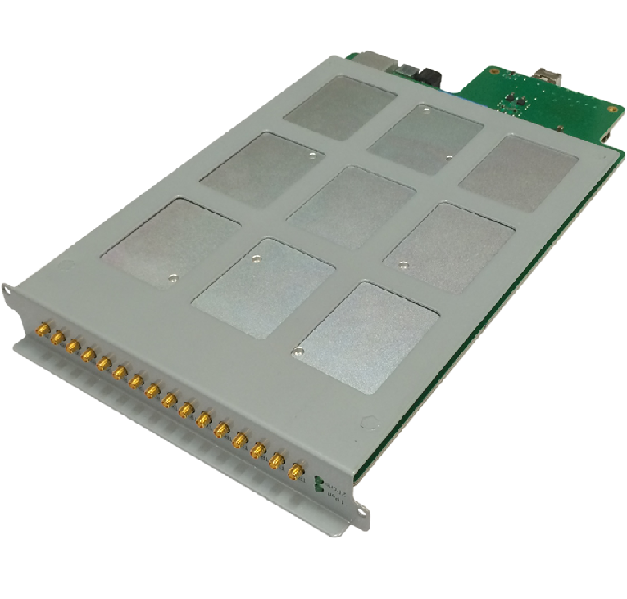 The RMB-101A (download datasheet) is a high-performance Software Define Radio (SDR) 8Tx/8Rx Multi-Channel Transceiver Module for a Remote Radio Unit for a Base Band Unit (BBU) located from a few meters to over 10 km away from the radio in a C-RAN type network or for distributed massive MIMO. A single RMB-101A can be used for 8Tx/8Rx MIMO, and multiple modules can be grouped together for a large scale massive MIMO radio unit. See our product Avalo-RU64A for an example of a 64Tx/64Rx 3D MIMO Remote Radio Unit. The RMB-101A module supports both TDD and FDD operations, and can be used for most general-purpose multi-radio SDR applications, and for LTE-A, LTE, WiFi, WiMAX, GSM, CDMA, WCDMA etc. Each module includes 4 independent 2 x 2 transceivers, and 4 independent 2 channel receivers or BTS sniffers. It has a very wide RF working band from 70 MHz to 6 GHz, RX channel gain > 70 dB, NF 3 dB, tunable channel bandwidth from less than 200 KHz to 56 MHz, TX noise floor < -156 dBm/Hz, TX power control range up to 90 dB, TX EVM < - 40 dB and channel isolation > 55 dB. The module uses integrated fractional-N synthesizers and the max LO step size only 2.4 Hz. 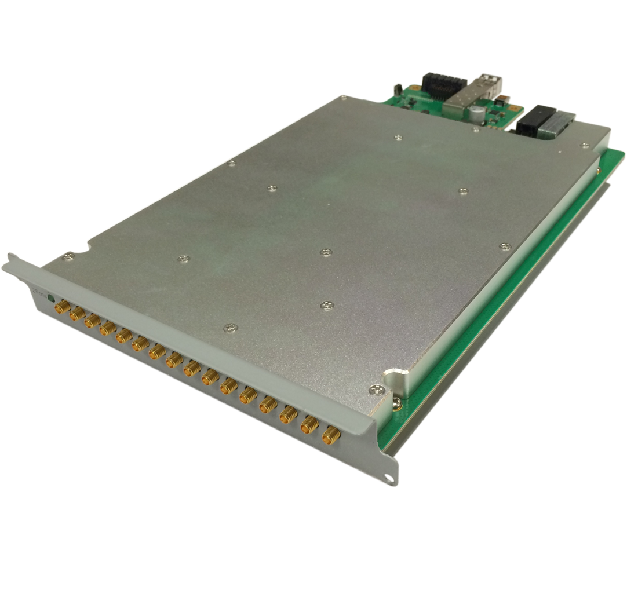 For the data and control interface, the module has a high speed SERDES that can be configured as a 10Gbps Ethernet or as a CPRI optical fiber interface with the bit rate up to 9.8304 Gbps, sufficient to transport 8 IQ streams. A clock recovery and PLL circuit recovers the clock from the CPRI link and synchronizes all 8 radios on frequency and phase. All 8 radios are supported by a single Kintex 7 FPGA XC7K325T FPGA which has 840 DSP48 slices, 55,650 logic slices, 356,160 logic cells and 25.74Mb of block RAM.